In short, the Wetlands. 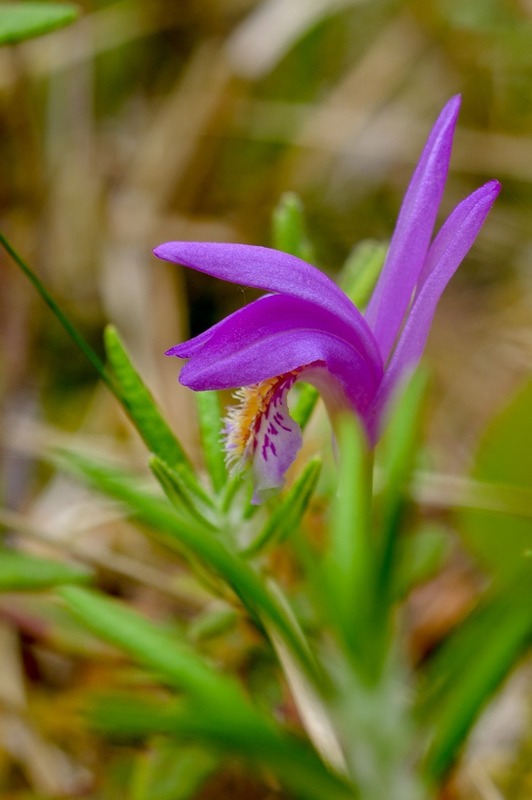 A mere 75km north of Winnipeg, the wetlands are a treasure trove of wild plants and flowers. What attracts most people to these wetlands is the abundance of medicinal plants, edible plants and orchids. Lots of orchids. 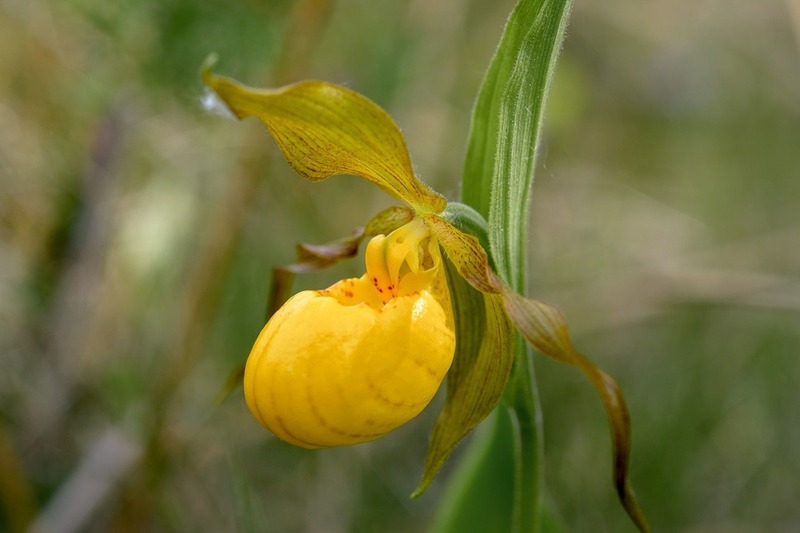 Out of the 36 species of orchids in Manitoba, the Wetlands have 23 of them. That is an impressive number. 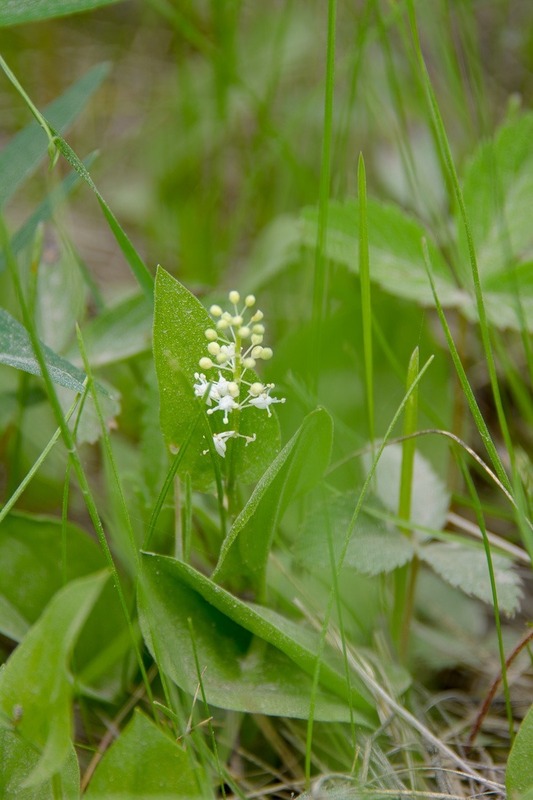 While many of them can also be found elsewhere, largely diluted by other plants, here, they come fairly concentrated along a trail of about 2.5 kilometres. The Brokenhead Wetlands are a cedar bog, a fen and a swamp, all rolled in one. Like I said, orchids are plentiful, as much as one wants to look for them and knows how to spot some of them. I went there with a friend last Saturday, early morning around 8am. Nobody was there yet, not even mosquitoes. As to be expected, they can get pretty bad in the swampy area and in the woods where there is hardly any wind. Today we were lucky. When I got out of the car in the parking lot, the first thing that struck me was that while most of the grass is neatly cut, some patches are left undisturbed and grow wild. Kind of a sloppy job, right? In fact, the patches are protected as they contain(ed) protected plants. Cutting them along with the grass would be criminal. So they were my first subject of scrutiny. 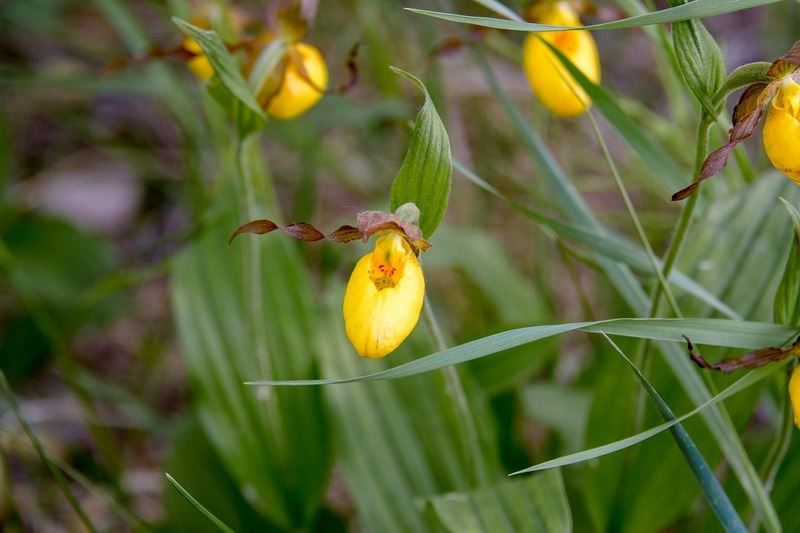 The patches didn’t disappoint, they contained the above Northern Small Yellow Lady’s Slipper. Quite the mouthful for such a little flower. The biggest of these I have seen were merely 2cm long, less than an inch. 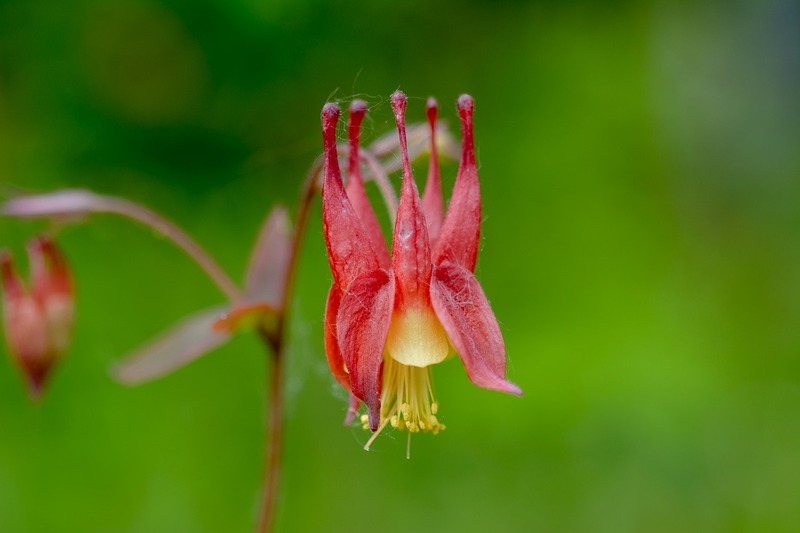 The next targets were the Columbine, abundant in some places. If the wind cooperates by staying away, you can get great pictures of these. The pictures in this post were all taken with a 60mm macro lens with the camera on a low tripod for stabilisation. Trying to get good pictures without a tripod in most cases goes wrong in this place. 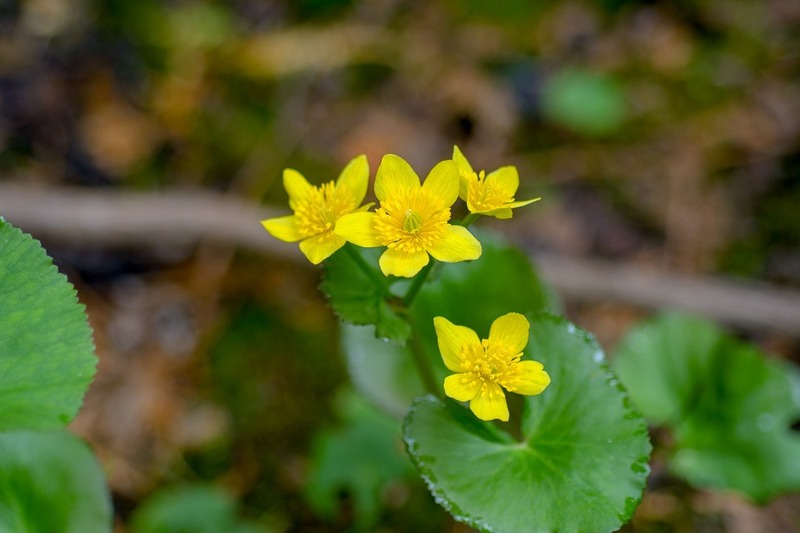 Once we were on the path into the preserve, some Marshmarigolds were trying their best to impress. I accommodated them with a picture. If you have the impression that my photos are over saturated, please keep in mind that in many of them I have had to tone down the saturation in order to show the reality. Everything here is simply screaming with colour. 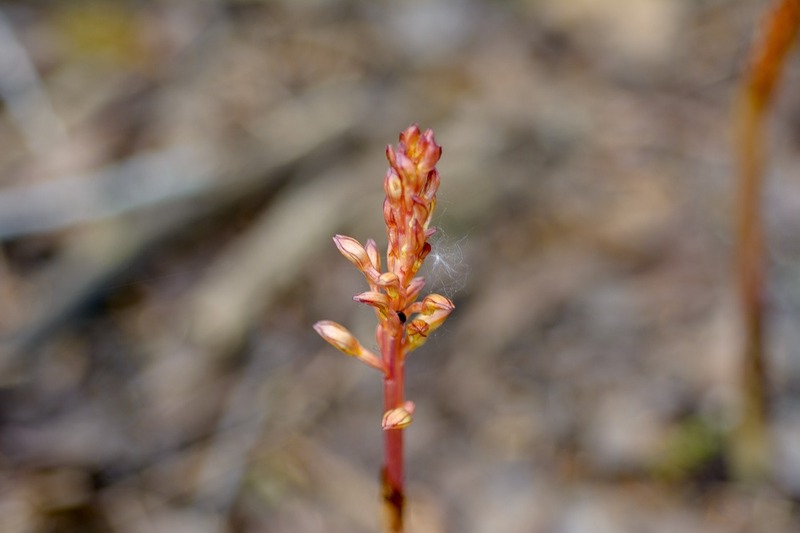 After a few hundred metres on the boardwalk, we came across the Spotted Coral Root, an orchid without chlorophyll, it depends on fungi in the soil it grows on for nutrients. 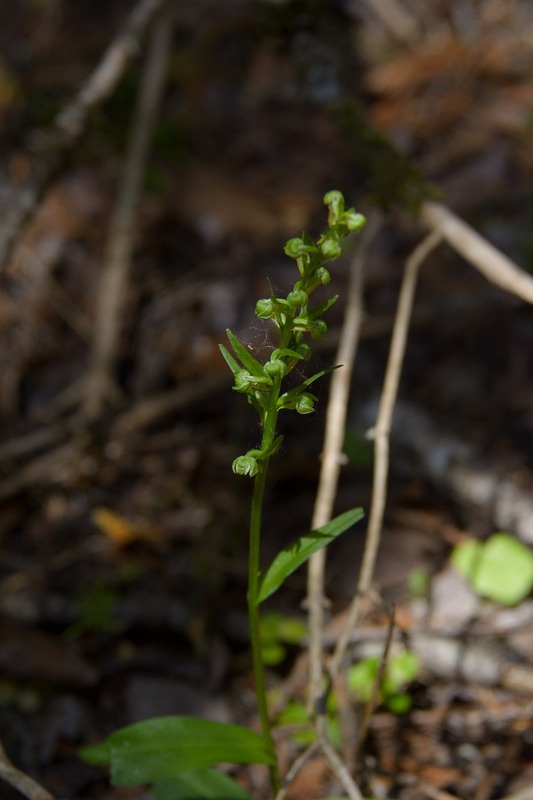 These orchids grow about 20-25cm high here, some grow all by themselves, others must have found the motherlode of nutrients and grow in clumps. Then we came across a “field” of white flowers called Labrador Tea (Ledum Groenlandicum). 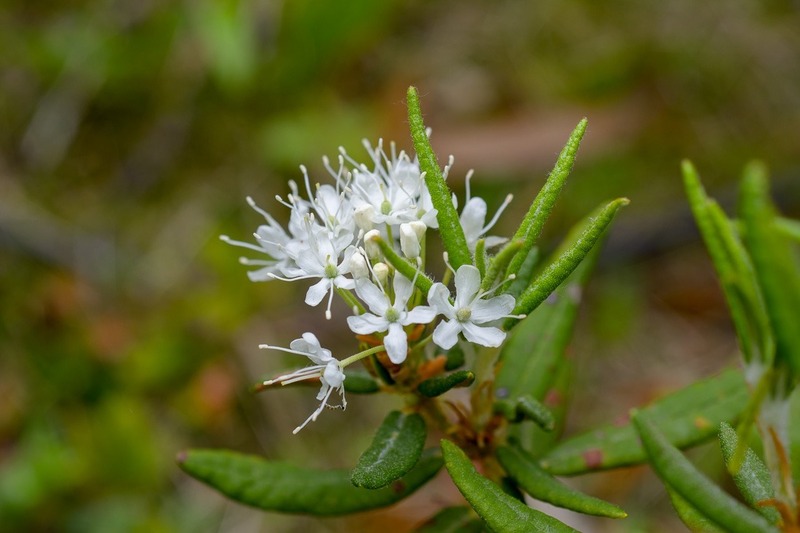 It is known by the Ojibway as “Swamp Growing Tea” it is rich in Vitamin C, and is used to treat stomach flu, headaches, colds and fevers, Not exactly the kind of tea I would drink on a pleasant night before bedtime . Among those bushes of Labrador Tea, I spotted something violet. Quite the difference from the rest of the environment. It turned out to be another orchid called Dragon’s-mouth, a rare orchid. Well, in the Wetlands it is not so rare, we saw at least half a dozen other plants in there in different places. The walk went on through the fen, a swampy, highly calcareous, watery environment with numerous carnivorous plants and flowers. I will blog about those later. 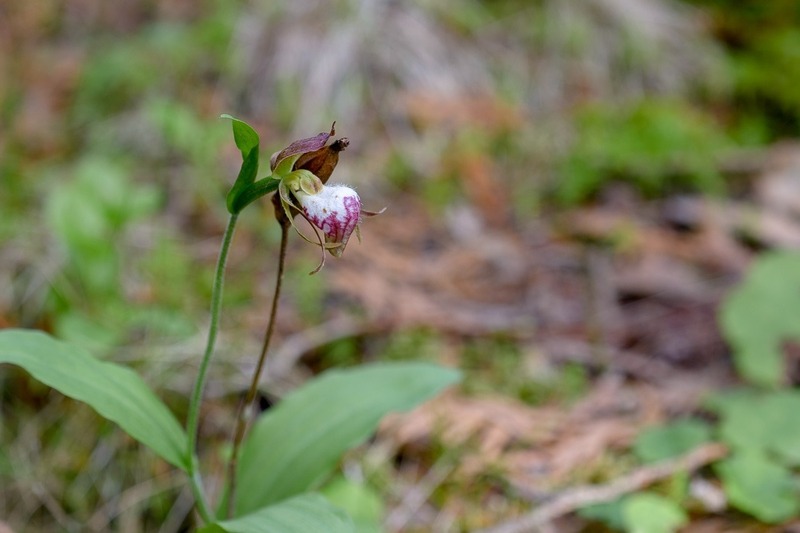 Talking about that rare Ram’s Head Lady’s Slipper… here it is. The flower itself is barely 10mm big, while the stem is hardly 10cm tall. It is difficult to spot, thanks to its small size. I was happy to spot two of them not far away from each other. It must be said and repeated that picking any of the plants or flowers in the Wetlands is prohibited. All of them are protected provincially, federally or internationally. I consider myself very fortunate to have found these for the second year in a row, albeit in very different places in the Wetlands. This was not the end of our Orchid Discovery tour. The Large Yellow Lady’s Slipper just begged for a picture. There were many around, but since getting off the boardwalk is prohibited, they were simply too far away. This was the only one growing next to the boardwalk for me. By now, there were many people coming into the area, laying down on my belly on the boardwalk was no longer an option. The last picture of the trip was of this White Adder’s Mouth, nearly hiding in the grass. However, once I had seen this one, many others became visible too. Funny how sometimes you just have to lift the corner of the carpet to find everything that is hidden underneath it. The next day, I went back with a group of people. They all had different interests, many of them not flora or fauna at all. Shooting with my 60mm and laying down on the boardwalk was not a good idea. So I went in with my 300mm to shoot things from a more “respectable” distance, as well as trying not to hold back the group. While I already had most of the orchids I was looking for the previous day, more was to come. Wildlife like the Four Spotted Skimmer above were on the menu for this day. 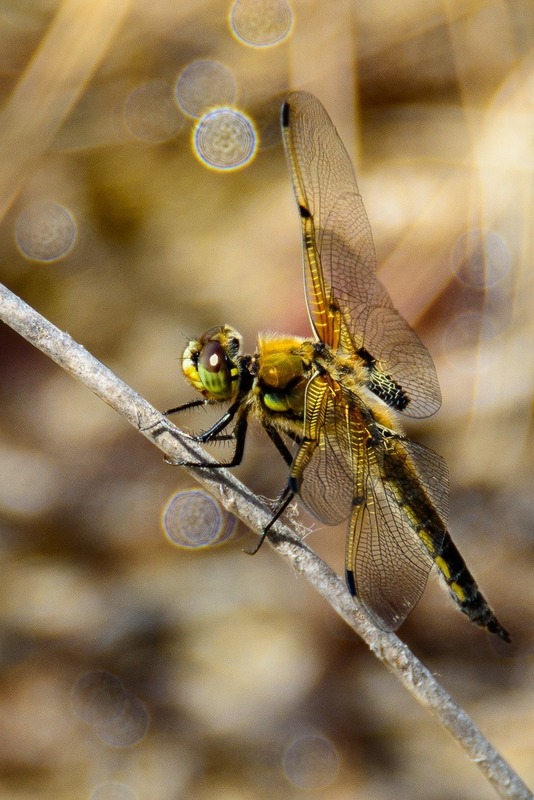 However, all of them, as far as I could see were the same Four Spotted Skimmers, so no use in posting them all here. 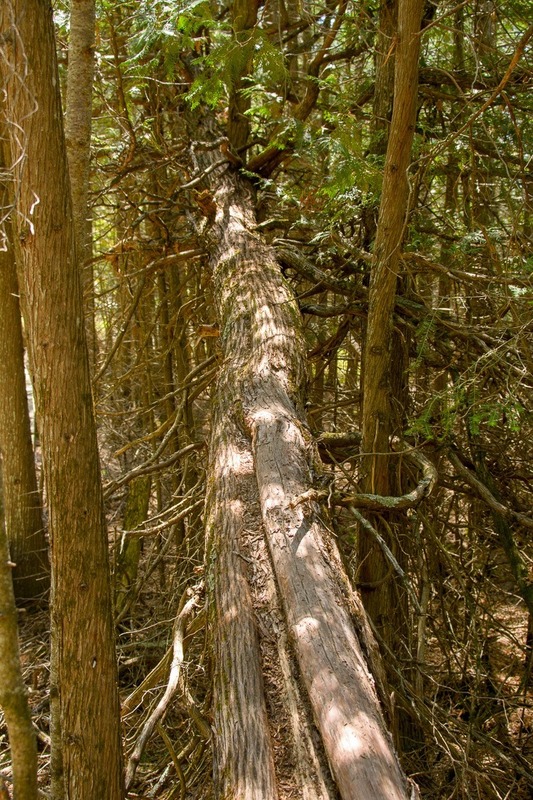 A cedar bog is made from cedar trees, both current and ancient. The current ones become ancient and fall down. When they are not a hazard for people, they are left there for nature to reclaim them as it sees fit. The last picture of this day is the lead picture of this post. A Blunt Leaf Rein Orchid, one that I hadn’t spotted the previous day. Seven different orchid species in a weekend, while probably missing out on a few others in the process… Not bad, eh? If you have a chance to go to the Brokenhead Wetlands, don’t hesitate, it’s about 75km north of Winnipeg, off of HWY59. It’s well worth the trip.